The customer’s complaint on the Bed Bug we normally keep set up for bed edging quit working. 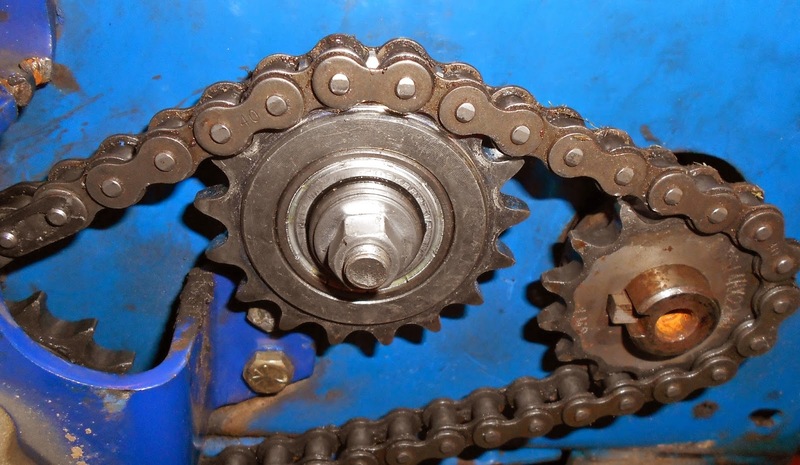 A quick inspection revealed the tin idler sprocket failed and the chain came off the drive sprocket. This Husqvarna Blue Bird Bed Bug would get a “Tractor Supply” solid steel sprocket. The Husqvarna supplied cheap tin idler sprocket has been a constant point of failure across the Husqvarna Blue Bird line of products. We have used the “Tractor Supply” solid steel idler on Blue Bird Aerators, Sod Cutter and our other Bed Bug without a single failure. This Bed Bug would also get the broken bolt replacement of set screw failures. We have tried to keep set screws from loosening by using thread locking glues, and doubling up set screws with no success. The machining of the shafts, hubs and sprockets are too sloppy for set screws to hold. Our fix for the constantly loosening set screws is to use a 5/16 hardened bolt that is torqued to a point of breaking. This has solved much of the sprocket and hub loosening that we see on Bed Bug Bed Edger’s. In completing the repair we found a defective weld on the Blade we replaced in June. Half of the weld on a center tooth shows no penetration into the steel. The Blade is made by a New York state Manufacturer; warranty claims on defective blades always fall on deaf ears. The Manufacture claims they are not responsible because they supply blades built to Husqvarna specs. Husqvarna is just a wasteland of incompetence. Cost is another $200.00 blade, $20.00 Tractor Supply Idler, $20.00 for a new chain and miscellaneous hardware. Total cost of repair with labor $300.00.